A few weeks ago I mentioned that some of my fellow mixologists and I had decided to try our hands at an Iron Chef-like cocktail contest. Each month we’d have a base ingredient, around which we’d build an original cocktail. Josh and Chris were the two who first broached the subject. I eventually glommed on to the project and offered to help promote it. Each person in the contest would have one vote (which you couldn’t use towards your own). Then, whoever won, would choose the next theme. It was decided that a beer-based cocktail — or beertail — would be the first themed cocktail we’d make. I then promptly became snowed under with the show at the theater and lost track of time. The deadline for submitting the recipe was one week ago today. I screwed the pooch on that initial deadline. So, this afternoon I threw myself upon the mercies of the other contestants asking for a late submission. Thankfully, they gave me the green light. But, since they were actually on time, here’s their submissions to the Beertail Contest. Josh‘s entry: He missed deadline too! I’m not alone! Julie‘s entry: Her too! Man, I feel better! 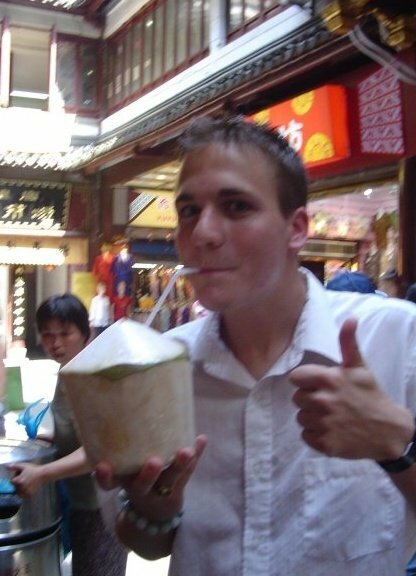 Good job Chris and Drink Gal! You made the rest of us look lazy! But, I’m here with my entry a week late! So while the two entries that have made it into the contest so far look absolutely gorgeous and tasty, I decided to take a different approach to the concept. In my life, I’ve come to associate a delicious frosty beer with convenience on a hot summer evening. It’s the drink grilling is made for. It’s an honest drink. If you don’t want to take the time to make a mixed drink, you could crack open a cool one and relax. So, I wanted to make my beertail with ingredients that can be found in any bar worth it’s salt. And in a home bar. That, or something that’s easily made and doesn’t cost an arm and a leg. Because it’s harvest season around my town — and my day job is heavily ag-based — I decided to go with an unfiltered wheat beer for the base. 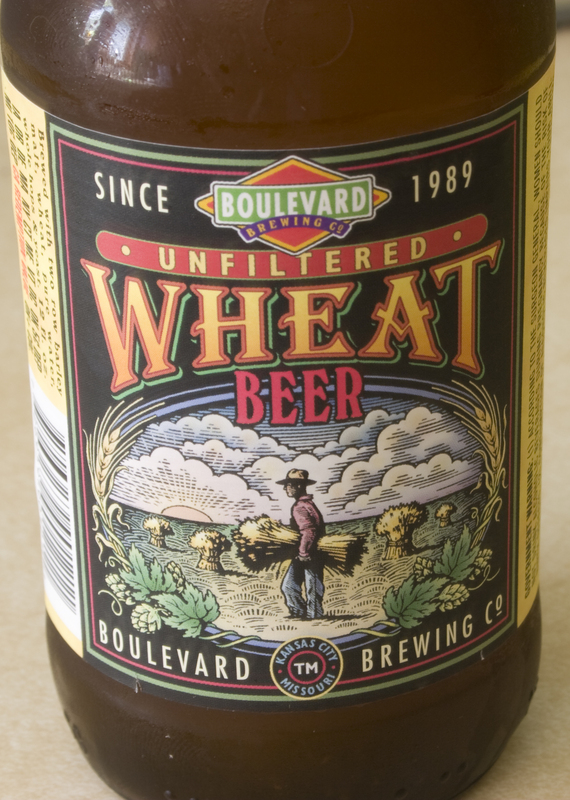 I love using local, so I went with Boulevard Brewery‘s Unfiltered Wheat. Now, Boulevard’s wheat beer is a solid, summery beer. It lends itself well to citrus garnishes, and has a smoothness you don’t always get from some similar beers. (In fact, standard procedure is to serve this out of the tap with a slice of orange or lemon). And it was that light flavor I wanted to harness to make something even more fitting for a summer’s night out. I figured since today is the first day of summer it all fit in perfectly! Pour your beer into a chilled pint glass. Pour in your honey syrup and sweet and sour. Very, VERY gently stir to mix the flavors together. You will get a little bit of foam-up, but if you’re being gentle you shouldn’t have a mess to contend with. Let the drink settle. 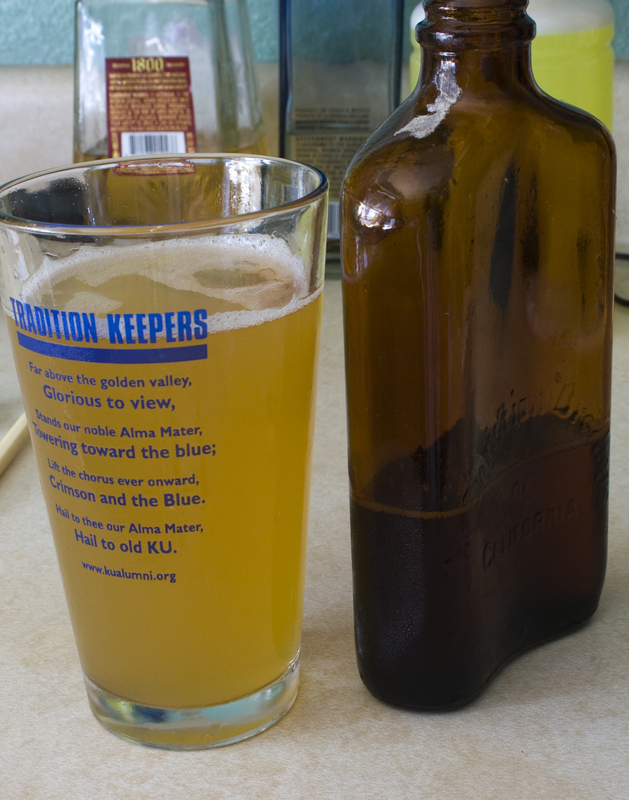 You’ll notice the beer has become a bit more hazy, but still maintains that beautiful golden color. The honey syrup gives the light wheat beer more body, while the sweet and sour gives you that great citrus flavor that goes with Boulevard so well. The taste is floral, and reminds me of spending a morning out tromping through the fields. It smooth, refreshing and just a little bit sweet. And, for those who don’t like beer, it takes off a bit of that beer bite. You have the great beer taste still there, it’s just a bit more smooth. I approve. Even Jenn grudgingly agreed it was tasty! Nice! Three days until I’m back in Boulevard country. Can’t wait. I’ll have to make you one when you’re out! Really good and really simple! What a great idea this is. Frankly, I don’t know which beertail I’m most excited to try first. Regardless, this is awesome, and I think they’re ALL going to be fun to experiment with. Cheers to all!